In reading the recent discussions that Republican Presidential Candidate John McCain had with beliefnet.com, I found something that made me laugh while simultaneously throwing up my pop tarts. Of all the tacky, no-good, cheap tricks that the religious right could pull, now we’ve got a meter to tell us how godly these folks are. I’m sure you’ll notice the separation of blue and red. 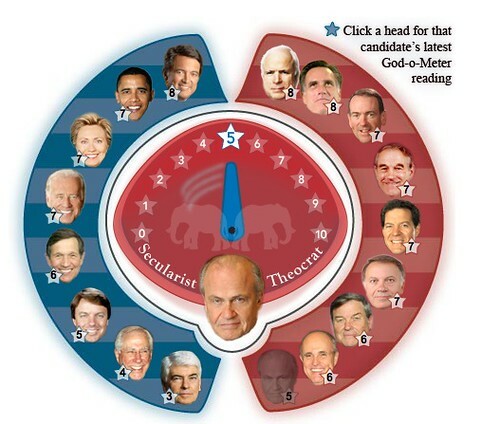 “God” forbid they would place a Republican on the wrong side of the God-O-Meter. This seriously makes me vomit. When it comes to the Republican primaries, the voter choice for a candidate is heavily influenced by the frequency with which they attend religious services. The results come from polling both Republicans and those leaning toward Republicans. It also includes potential candidates as well as some who have backed out. Of those who attend services seldom or never Rudy Giuliani 33%, Fred Thompson 18%, John McCain 18%, Mitt Romney 8%, Newt Gingrich 6%, Mike Huckabee 2%, Ron Paul 3%, Duncan Hunter 2%, Sam Brownback less than half a percent, Tommy Thompson 1% Chuck Hagel less than half a percent, Tom Tancredo 1%, Jim Gilmore less than half a percent. The percentage is pretty much the same across the board with the exception of the overall leader, Rudy Giuliani who gets most of his support from those who go to church less frequently. On the Democratic primary side, the results are very different. Of those who attend services weekly, Hillary Clinton 39%, Barack Obama 24%, Al Gore 13%, John Edwards 10%, Bill Richardson 2%, Joe Biden 2%, Dennis Kucinich 1%, Mike Gravel less than half a percent, Christopher Dodd less than half a percent, Other/none/no opinion 8%. Total polled, 364. Of those who attend rarely or monthly, Hillary Clinton 34%, Barack Obama 26%, Al Gore 13%, John Edwards 14%, Bill Richardson 3%, Joe Biden 4%, Dennis Kucinich 1%, Mike Gravel less than half a percent, Christopher Dodd 1%, Other/none/no opinion 5%, Total polled 325. Of those who attend seldom or never, Hillary Clinton 32%, Barack Obama 20%, Al Gore 20%, John Edwards 11%, Bill Richardson 5%, Joe Biden 2%, Dennis Kucinich 2%, Mike Gravel 1%, Christopher Dodd 1%, Other/none/no opinion 6%. Total polled, 794. In related news, Fred Thompson is said to be courting religious leaders in an effort to secure their support before announcing his run for the 08 Republican nomination. Thompson is a mildly moderate religious man at best. He barely goes to church. Yet, because he does not publicly support abortion like Giuliani and is not a Mormon like Romney, the religious leaders will probably entertain his interests before the other republican front-runners. Is it interesting that Thompson is a front runner before even having announced an official run? My claim is that if Romney weren’t a Mormon, Thompson would have declared his run by now. The only reason Thompson hasn’t officially entered the race by now is because there’s a weak point with every other Republican candidate that’s keeping them from being a clear front-runner. If Romney weren’t a Mormon, he’d have the support of the majority of Republicans and Thompson would view him as more serious competition. That’s my opinion, of course. Next they take a look at how this equates in a Presidential race between the two leaders, Rudy Giuliani and Hillary Clinton. Giuliani wins with the ones who attends weekly, 61-34%, in the weekly or monthly group he also wins with 64-31%. In the seldom or never group, Senator Clinton wins 49 to 46%. After watching the GOP debate last night, it’s painfully clear that this year’s general election will be one with plenty of deviciveness on the issues. This won’t be a repeat of the 2000 election debates in which Gore and Bush were almost in agreeance on many of the issues. The GOP candidates were asked to revisit the famous question from the previous debate in which they were asked to raise their hand if they did not believe in evolution. As you know, three of them did. There are some pundits out there that are hoping that I will distance myself from my church so that will help me politically — and that’s not gonna happen. In the beginning, God created the heavens and the Earth. A person either believes that God created the process or believes that it was an accident and that it just happened all on its own. If Americans want a president who doesn’t believe in God, there’s probably plenty of choices. But if I’m selected as president of this country, they’ll have one who believes in those words that God did create. If anybody wants to believe that they are the descendants of a primate, they are certainly welcome to do it. Whether God did it in six days or whether he did it in six days that represented periods of time, he did it. And that’s what’s important. In other words, he doesn’t remember what is generally accepted to be true by 95% of the scientific community and what we all learn in order to graduate high school. I believe we are created in the image of God for a particular purpose, and I believe that with all my heart. I am fully convinced there’s a God of the universe that loves us very much and was involved in the process. How he did it, I don’t know. One of the problems we have with our society today is that we’ve put faith and science at odds with each other. They aren’t at odds with each other. If they are, check your faith, or check your science. First of all, we shouldn’t be looking to Kansas for the authority on the school/religion relationship. Secondly, let me address Brownback’s statement by simply saying that the Bible, as he interprets it, is not consistent with what we know about our world. Another devicive issue last night was gays in the military. While not a devicive issue between the GOP candidates themselves, they unanimously differ from all the Democratic candidates. Every GOP candidate believes that a gay person should be able to be kicked out of the army if they are openly gay. One of the more interesting moments came from a lightning strike on the building in Manchester, New Hampshire. It occured while Rudy Giuliani began to speak about his stance on abortion. Note that the media, appealing to religious folk, are playing this up as more than a coincidence! WASHINGTON – Seven years after George W. Bush won the presidency in part with a direct appeal to conservative religious voters, it seems all the leading 2008 presidential candidates are discussing their religious and moral beliefs, even when they’d rather not. Democratic Sens. Hillary Rodham Clinton and Barack Obama have hired strategists to focus on reaching religious voters. Democrats in general are targeting moderate Roman Catholics, mainline Protestants and even evangelicals, hoping to put together a winning coalition. Some top-tier Republican candidates, the natural heirs to conservative religious support, are finding the issue awkward to handle. Former Massachusetts Gov. Mitt Romney has been questioned so much about his Mormon faith – 46 percent of those polled by Gallup in March had a negative opinion of the religion – that he has taken to emphasizing that he is running for a secular office. Former New York Mayor Rudy Giuliani, a Catholic who says he gave serious consideration as a young man to becoming a priest, is fending off critics because he supports abortion rights. In past campaigns, Republicans nearly cornered the conservative religious vote. Now, Democrats are speaking plainly about their beliefs. “I think the majority of Americans, the people who largely decide elections, what they are looking for – particularly in these times – is a really good and decent human being to be president,” Sen. John Edwards said in an interview with the Associated Press. Democratic Sen. Chris Dodd, a Catholic, told an April forum at Boston College that Democrats have made “a huge mistake over the years” by not talking more openly about how their personal faith informs their public-policy positions. But Obama’s close relationship with his own pastor at Chicago’s Trinity United Church of Christ has become a campaign issue. The cleric’s theology emphasizes “black values” and strengthening the black community. Seven of the 18 candidates for president – four Democrats and three Republicans – are Catholic. Besides Giuliani, the four Democrats also support abortion rights. Focus on the Family Chariman, James Dobson, says he won’t vote for Rudy Giuliani for President in the 2008 Presidential Elections due to Giuliani’s Pro-Choice stance. He also cited issues with Giuliani’s support for homosexual couples, personal marital past and showed concern for his lack of remorse regarding having cheated on his wife. There are other moral concerns about Giuliani’s candidacy that conservatives should find troubling. He has been married three times, and his second wife was forced to go to court to keep his mistress out of the mayoral mansion while the Giuliani family still lived there. Talk about tap dancing. Also during that time, the mayor used public funds to provide security services for his girlfriend. The second Mrs. Giuliani finally had enough of his philandering and, as the story goes, forced him to move out. He lived with friends for a while and then married his mistress. 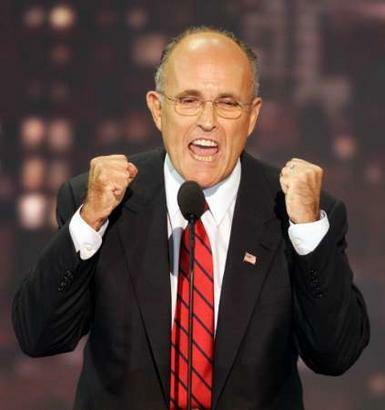 Unlike some other Republican presidential candidates, Giuliani appears not to have remorse for cheating on his wife. Harry Truman asked, “How can I trust a man if his wife can’t?” It is a very good question. Here’s another one: Is Rudy Giuliani presidential timber? I think not. Can we really trust a chief executive who waffles and feigns support for policies that run contrary to his alleged beliefs? Of greater concern is how he would function in office. Will we learn after it is too late just what the former mayor really thinks? What we know about him already is troubling enough. One more question: Shouldn’t the American people be able to expect a certain decorum and dignity from the man who occupies the White House? On this measure, as well, Giuliani fails miserably. Much has been written in the blogosphere about his three public appearances in drag. In each instance, he tried to be funny by dressing like a woman. Can you imagine Ronald Reagan, who loved a good joke, doing something so ignoble in pursuit of a cheap guffaw? Not on your life. As Dobson is looked upon for leadership in the Religious Right Community, this will surely strike a blow to Giuliani’s campaign. However, one could argue that many of the far-right members of the Republican party were already swaying away from the candidate for the very same reasons. An interesting critical article about Dobson. You are currently browsing the archives for the Rudy Giuliani category.